The Healthy Soils Program offers producers incentives to adopt GHG-reducing soil health practices. The program also funds on-farm demonstration projects. Healthy soils store carbon and improve crop yields, drought and flood tolerance, and air and water quality. CalCAN and our partners have been leading advocates for this program. 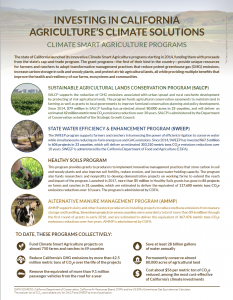 It is coordinated by the California Department of Food and Agriculture (CDFA). In his January 2015 inaugural address, Governor Brown announced the launch of a new Healthy Soils Initiative, a collaboration of state agencies and departments to promote the stewardship of healthy soils. This initiative was long championed by CalCAN and our partners. That same year, Governor Brown proposed the program receive $20 million from the state’s Greenhouse Gas Reduction Fund (derived from cap-and-trade revenue), but the state legislature allocated only $7.5 million. The program has since received another $15 million from a combination of the Greenhouse Gas Reduction Fund and Proposition 68. CalCAN continues to advocate for this program’s funding and provides input to CDFA as it implements and refines the program.